Only I can manage to throw meat in to a meatless Monday! I’m telling you the day I had, I had no choice… True story! We all have those days, mind too bogged down with Mondayness to even think of what to make for dinner let alone something meatless! This was definitely one of those days for me; even after a trip to the supermarket and only leaving with breakfast stuff, I still had no idea what to cook.. But wait! breakfast for dinner… Now that is something I can dig on such a Monday; sausages and beaked beans… mmmhh! This recipe is something of a mix them- gather them. I call it a casserole but really it’s just a ‘gitoero’; everything thrown in with no real plan… Yes! you know you have those days too! I made a concentrated tomato sauce with chillies and cider vinegar. I love making the sauce this way, I just throw in halved tomatoes in a pot with cider vinegar, sugar, salt and chillies and let it simmer. The result is this lovely concentrated tomato sauce packed with flavour, when you put your face right in there the pungent aroma of the chillies and the cider filled tomatoes leaves you a little light-headed, your nose stained with that smell. Absolutely intoxicating! Start by making the tomato sauce; put the chopped tomatoes, chillies, cider vinegar and sugar in a saucepan over a low heat. Cover and let it simmer for about 30 minutes, stirring to avoid the tomatoes sticking to the bottom. When the sauce is done, put it through the blender, adding a little water to loosen it up a little. Salt and pepper to taste. Fry the sausages in a little oil for about 8-10 minutes, turning them regularly. Remove and set aside. In the same pan, add the onions and garlic. Cook until onions are soft and brown. Next add the chopped chillies and the sausages; I cut my sausages in to bite size pieces. Add the tomato sauce and red wine to the sausages, stir and bring to the boil before lowering the heat and simmering for 10 minutes. The last thing to go in is the baked beans. Pour them in to heat through just before serving. I don’t like them too mushy. 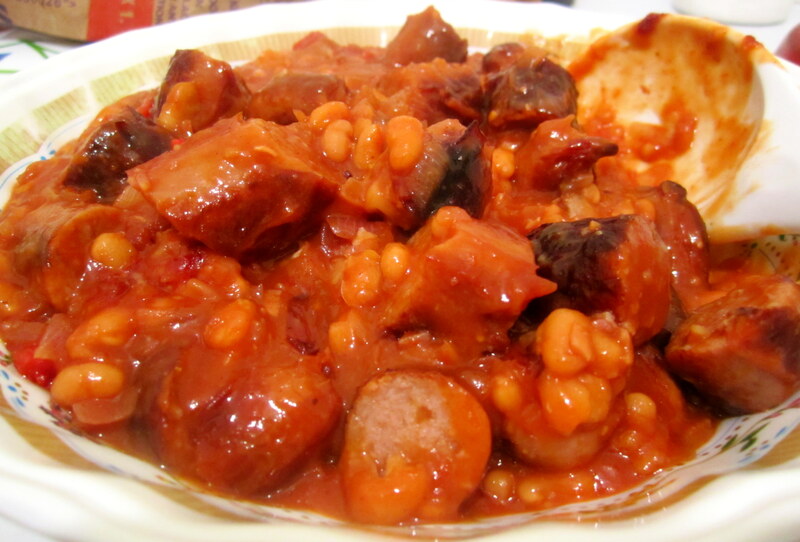 There you have it folks… Gitoero kia sausage, I mean sausage casserole! Meatless Monday will resume soon, I promise.